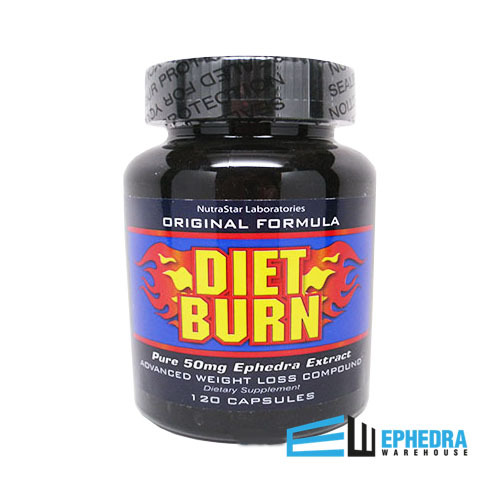 Diet Burn incorporates effective thermogenic ingredients: Ephedra, Hoodia Extract, Synephrine, White Willow Bark, and Guarana. Do you miss DietFuel? If so, Diet Burn delivers everything its predessessor did and much more. With Diet Burn, you may just watch your excess fat melt away! Diet Burn can give you increased energy levels, suppress your appetite, boost metabolism, and optimize mental focus. Don't wait. Try Diet Burn today!! 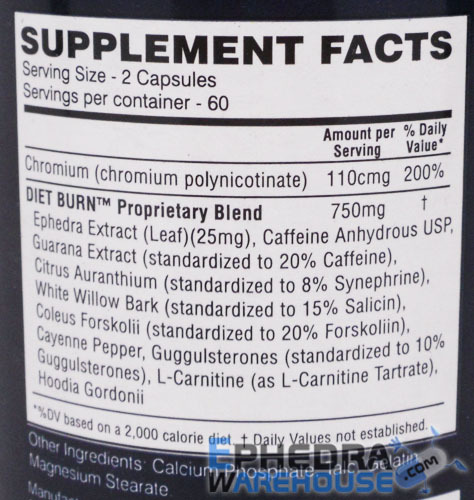 Diet Burn Proprietary Blend 750mg Ephedra Extract (leaf)(25mg), Caffeine Anhydrous USP, Guarana Extract (standardized to 20% Caffeine), Citrus Auranthium (standardized to 8% Synephrine), White Willow Bark (standardized to 15% Salicin), Coleus Forskollii (standardized to 20% Forskoliin), Cayenne Pepper, Guggulsterones (standardized to 10% Guggulsterones), L-Carnitine (as L-Carnitine Tartrate), Hoodia Gordonii. Calcium Phosphate, Talc Gelatin, Magnesium Stearate. As a dietary Supplement, take two capsules daily preferably with food and water. love this item use it almost everyday helps with allergies. hope it is not being discontinued! !